Hermit crabs are not really crabs but look very much like them. They are usually reddish or brownish in color and have two big pincher claws. They range in size from about one inch to one foot. Where Are Hermit Crabs Found? Most of the live in seas but there is also the terrestrial hermit crab who starts out its life in the sea but as it becomes a little older it develops the ability to breathe oxygen and would drown if it stayed in the sea. 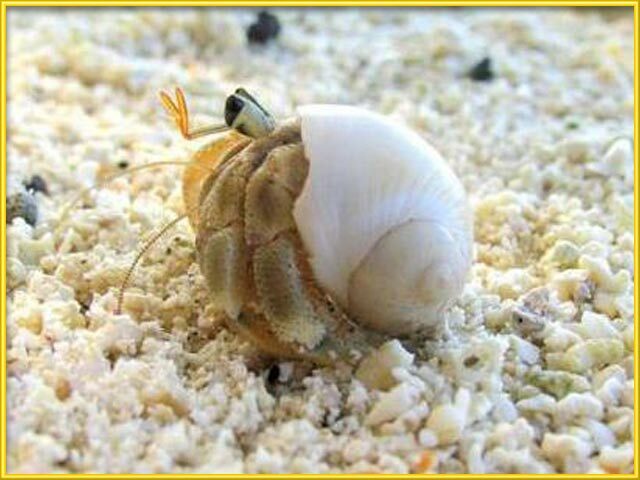 Hermit Crabs eat coral, clams and other crustaceans. Where Do Hermit Crabs Live? Wild Hermit Crabs live in colonies of about a hundred. They live in the ocean, close to the shore. Hermit Crabs do not have their own shells. They live in the abandoned shells of others in order to protect their soft bodies. When they get too big for the shell in which they are living, then they go looking for another. Sometimes two Hermit Crabs will find one shell and they will fight over it. If a Hermit Crab has a number of shells to choose from, it will change shells often.